When La Salle High School senior Winston Eubanks began his junior year, his only athletic goal was becoming a better football player. So he had an idea: run track. “I had no idea that it would lead to this,” said Eubanks. 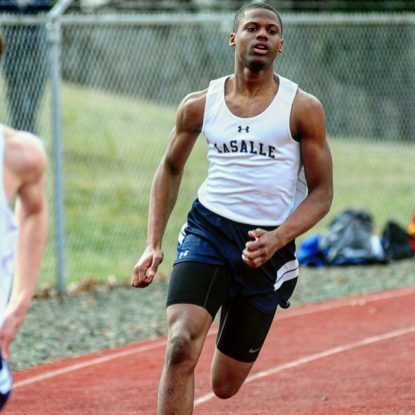 In the 122nd-annual Penn Relays that finished on April 30, Eubanks and three teammates supplied the Catholic League with a rather impressive highlight. In the 4×100-meter relay for large schools, La Salle placed an outstanding second. After taking a handoff from Chris Della Donna, Eubanks ran the second leg before transferring the baton to Kyle Johnson, who in turn dished to Charles Headen. La Salle’s time of 42.41 seconds was its fastest of the season. Before his junior year, Eubanks had never imagined running track, let alone as a vital part of a school-record foursome. In football, Eubanks was a wide receiver and kick returner. He helped the Explorers stun St. Joseph’s Prep in the Catholic League championship. In the Catholic League boys’ 4×400-meter relay, St. Joseph’s Prep placed first behind Bobby Dupell, Stephen McClellen, Aaron Sykes and Miles Green. Cardinal O’Hara finished second and La Salle third. In the girls’ 4×400-meter relay, the quad of Brittany Winter, Schola Eburnas, Christine Mancini, and Olivia Arizin lifted Cardinal O’Hara to a gold medal. Behind the Lions were Archbishop Ryan and Bonner-Prendergast. After a sterling 52-plus-year career coaching track and cross country, Ed Ulmer announced that he will retire at the end of the outdoor track season. After starting his coaching career as an assistant at since-closed Cardinal Dougherty, his high school alma mater, Ulmer became head coach at Archbishop Ryan for both the girls and the boys in 1966. Reaching 50 years at Ryan was special, Ulmer said, for it signified a distinct accomplishment. Five decades. Half of a century. The mind boggles. Ulmer, 73, will be missed by students, athletes, peers and reporters. Why the latter? Because among the most reliable Catholic League coaches to promote his or her players with a return phone call has been Ulmer. Two years ago, Ulmer had openly talked about his inevitable retirement. He lauded his wife of now 54 years, Mary Ann, describing her as a “saint” for her dedication to the family – including five children and 13 grandchildren – while he was out coaching. He talked about how much he will miss his student athletes. And then, just like that, Ulmer’s focus turned back to his athletes at Ryan, where he has accrued an incredible 29 combined Catholic League titles in cross-country, indoor track and outdoor track and field. With less than one month remaining, the former longtime history teacher said he is basking in the same daily routine that has, in his words, helped keep him young despite the anxiety of schedules, weather problems, etc. He will have more to say at a career-ending banquet at Ryan on May 31. In the meantime, Ulmer will keep doing what he does best: coach.